In the heart of hot dog country, to be specific, at USDA site #0001, The Vienna Beef Factory, Chicago Illinois, Mark Reitman is teaching the art of the cart. After living a life on the bun he decided to teach the art and science of owning and operating a hot dog cart to a growing number of people looking to cook up their own business. Mark is a PH.D, (Professor of Hot Dogs) at Hot Dog University. Hot Dog U is serving the American Dream in a two day class on all things hot dog. This is definitely a course where you do not mind spending time after class. Mark has been preparing for his professorship all of his life. He grew up in the hot dog culture of Chicago’s west side. His first hot dog was on Maxwell Street (the Mecca of Chicago Hot Dogs) at the age of five. In the 1950’s he worked soda fountain of his dad’s drug store. In high school he flipped burgers and mixed malts at a local landmark known as Henry’s Drive-In. During college, he worked the best job of his career as commissary manager for largest all-girl dormitory at school. He then worked as a teacher and school counselor while working side jobs as a salesman and pinch hitter for various food businesses owned by family and friends. After decades of sales, schmoozing and deal making he could not convince his wife to open a hot dog stand with him so he asked if they could settle for a cart. In 2003, The Grateful Dog cart began serving to the public and Mark found that he had hit the mark for an independent business. People sought him out for tips and trade secrets for the art of the cart so he opened Hot Dog University in 2006. 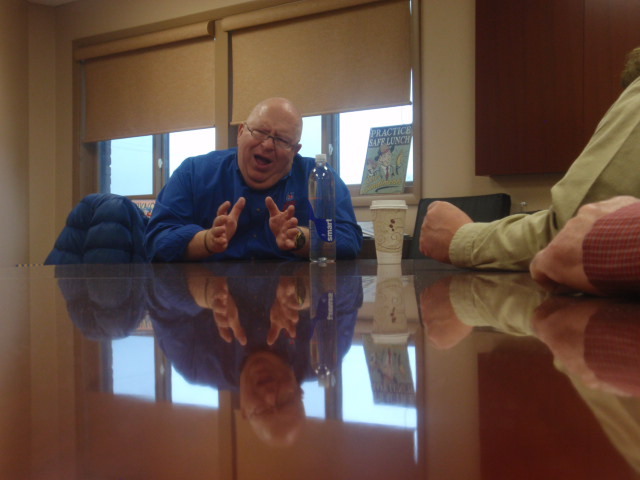 He started taking students to the Vienna Beef Plant to see and understand how hot dogs are made. As a result many of graduates began ordering and selling Vienna Beef hot dogs, which caught the attention of the company. In 2009, the Vienna Beef asked Mark to become part of the family and move the headquarters of Hot Dog U from Milwaukee to Chicago. Since it’s founding 500 plus students have graduated from Mark’s program. 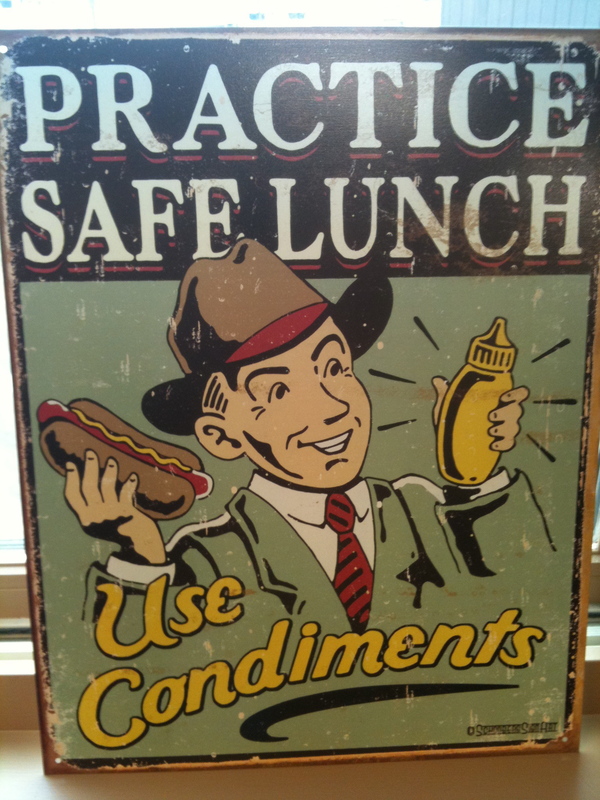 In 2010, 138 students passed through the hallowed halls of hot doggery at Vienna Beef. This year, added classes are continuing to fill up with people in search of the Amercian Dream. In April, I was one of those students. I met Mark in 2008 when I was touring Vienna Beef as part of the Dirty Frank’s Chicago Hot Dog research project. Since then, I have developed an in depth knowledge of Columbus Street food in the form of Taco Trucks and Mobile Vendors. I am a believer in street food and mobile vending. It is a sign of the times. While we might not be able to afford a steak nowadays we always seem to find time and money for a tubesteak. That is reality that inspires people to follow their dreams of being their own boss in the form of a hot dog cart. As our society and economy come full circle to the eras that celebrated the hot dog, the depression sandwich, (as the hot dog was known in the 1930’s) is seeing a resurgence. The hot dog, economical eating and a budget friendly start up business go hand in hand during our own hard times. The seven other students in my class came from around the country: New Mexico, South Carolina, Michigan and two sides of Chicago. We also had one student “stuck in Effingham” for most of the first day fighting snow and train delays. Everyone had a different story for enrolling in class. Every reason was a reflection of our new world – people need or want to take a risk to make a new life but something with limited risk and a proven track record is more appealing, especially for the culinary impaired. Mark made sure to cater the class to the needs and experience level of his students including his first ever mobile food truck vendor (as Mark and I agreed…the times they are a changing and the bigger the wheels the more hot dogs you can sell). Mark started with a frank discussion on running a small business. Any good businessperson needs to know their product. We donned our lab coats and hairnets for our first field trip. Since the pedigree of hot dogs has been poked fun at since their inception, we took a three-hour tour of the Vienna Beef plant to understand what makes an encased meat a hot dog. Mark became the Willy Wonka of Wieners during our magical meatery tour. We started with freshly butchered cuts of meat being cut by hand and followed those cuts of beef as they were sliced, diced, grinded, grinded again, encases, cooked, smoked and packaged. We never had to ask, “Where’s the Beef?” Throughout the tour were instructed on hot dog science and terminology: skinless vs. natural casing, 9:1, 8:1, 6:1, 5:1 and 4:1 hot dogs (graduates know what that means), what makes a hot dog snap, the difference between lamb/sheep linings and hog linings (parts are not just parts they have a purpose) and more. 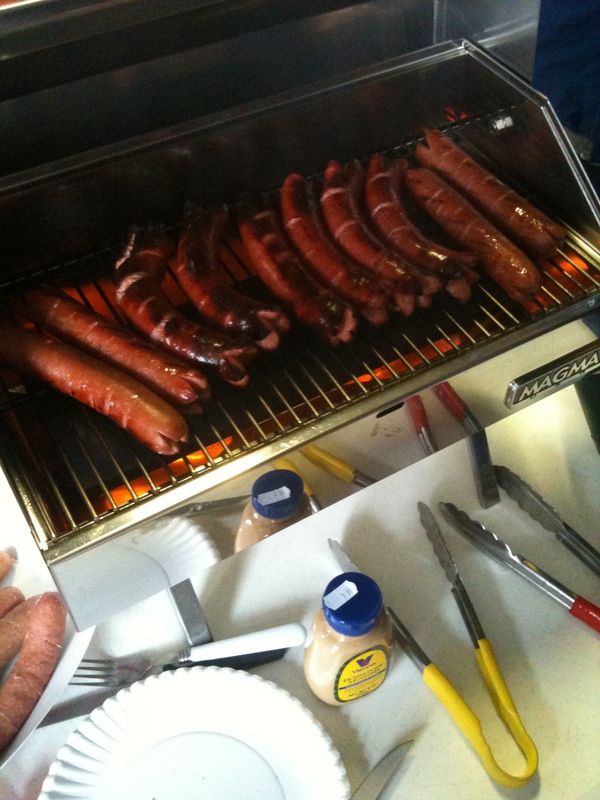 Mark led us to the test lab to try out a wide variety of hot dogs made at the plant and cooked different ways. We then watched the packaging process and visited the specialty departments before heading to the cafeteria for lunch… hot dogs of course. To say we were fully immersed in our first half day of class would be an understatement. Vienna Beef is an amazing wonderland of meat. Not all hot dogs are created equal (or even made with the same stuff). It is hard not to respect the commitment and adherence to tradition this family operated company maintains for their product. Vienna Beef hot dogs cost more but there is good sense for paying the extra cents. You do get what you pay for in the world of hot dogs. In addition to a variety hot dogs and sausages; the plant also produces 100 soups and six types of chili for retail and commercial businesses. 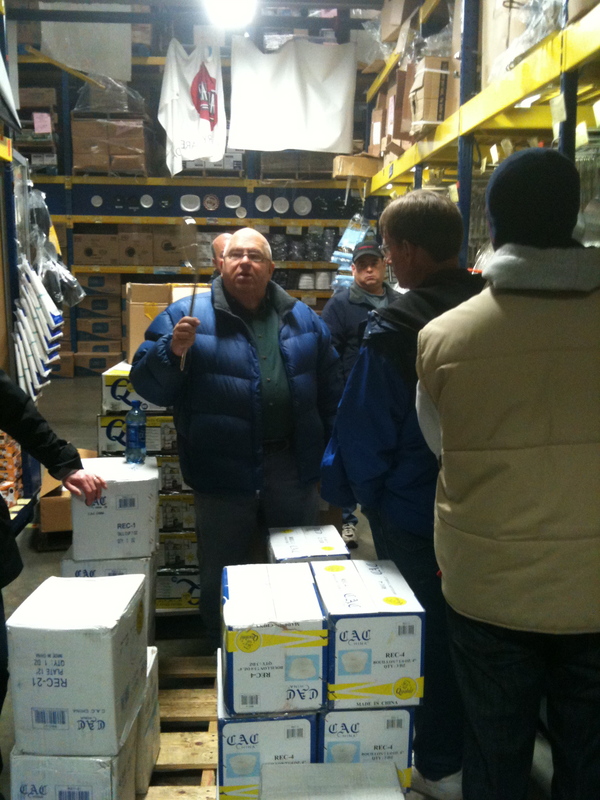 We headed back to the classroom for a whirlwind of information on choosing and outfitting a cart, permits, food safety, the proper temperature for (re) cooking a hot dog, finding a base station, pricing, marketing and more. My notebook, course manual and brain were as stuffed as a Polish sausage with information as I headed out of the class at the end of the first day. On day two, we met at Restaurant Depot to walk through the store using the seasoned eye of a street-smart street meat vendor. Mark instructed us on what to buy, what equipment to use and purchase, how to look at hot dog packaging labels to determine a plethora of information about the quality of the hot dog and a countless list of do and don’t for operating a cart. For example, tongs do matter. Get two sets and make sure they are springless. Don’t trust me on this, take it from Mark, he can give you ten reasons why. Don’t put the cart before the course if you can help it because knowing what is needed and how to equip a cart is going to save a new owner time and money and countless mistakes. Mark advises students not to buy a cart until after they take the class and time and time again, the sage wisdom of this was proven in our discussions. I walked out of Restaurant Depot armed with knowledge everything I would need to buy on day one of hot dog slinging, how much my equipment would cost and what to do with it…..or at least what not to do. The next part of class was the final exam: cooking hot dogs. We set up a cart in the Vienna Beef parking lot then had Mark run us through everything from start to finish. We steamed buns, grilled and simmered hot dogs and sausages, checked our water temperature and learned the art of selecting the right music for peddle our wares. We headed back to class after lunch for more advanced hot dog studies. Mark is a brainstormer and barnstormer when in comes to cart marketing. He explains how to use the five senses to sniff out business for your hot dogs. Hot dogs elicit an emotional response, to the right side of our brains. The smell of a hot dog and the primary colors with it (red and yellow) take us back to childhood (and if that grew up in Chicago takes you back to the neighborhood you grew up in). Owning your own business strikes an emotional cord too. Other practical tips are covered as well such as stocking the right beverages. The type of soda selected is a demographic and geographic choice – you need to know your customer or you could be stuck with a cooler full of Grape Crush at a field hockey game. What is the most important factor in a successful hot dog cart (other than the personality and dog tired resolution of the hot dog vendor)? Location, Location, Location. The class covers location with a couple genius ideas I never thought of in two years of chasing street vendors in Columbus. During our classes, the top dogs of Vienna Beef visited us. The Chicago Mob left town but not the sense of kinship that comes from doing business in the Windy City. In the most sincere and heartfelt tones we were told that Vienna Beef supported any business that sells their products and the examples given were not a haed sell. There is a true sense of family and everyone seems focused on wanting everyone new businessperson in this class to make their dream a reality. So was the class worth it. For me, absolutely (it was free). However, I was there as both a writer and a potential mobile operator. I would pay the full price for the class just for what comes after your graduate: people who can answer any question about the business you have and are committed to helping you get the resources you need to solve any problems you might encounter along the way. My notebook was full of things to save money, as well as minutes, weeks and months of missteps and wrong turns by getting first hand advice from someone that was successful in the business. As a parting gift, I am going to give one of Marks tips away (not a product endorsement). Ice Mountain plastic bottles are better because the labels are less likely to peel off in the icy water of a cooler. For my friends at Vienna Beef, Mark and the city of Chicago I should also state for the record….. never put ketchup on a hot dog. Thank you Hot Dog U for a useful education. There are a few places they sling a Chicago dog in Columbus. 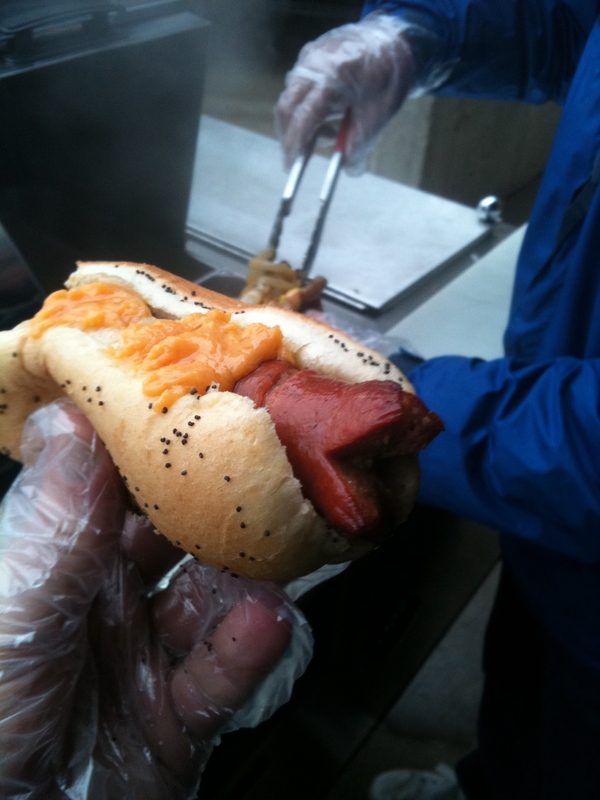 This entry was posted on May 24, 2011 at 1:22 AM	and is filed under culinary knowledge, hot dogs, Road Trip. Tagged: Hot Dog U, Hot Dog University. You can follow any responses to this entry through the RSS 2.0 feed. You can leave a response, or trackback from your own site. Awesome. Looking forward to seeing what you do with this increased knowledge of tubesteak. Follow your dream, young gourmand. Follow your dream. Sorry. This made me chuckle considering the subject matter. 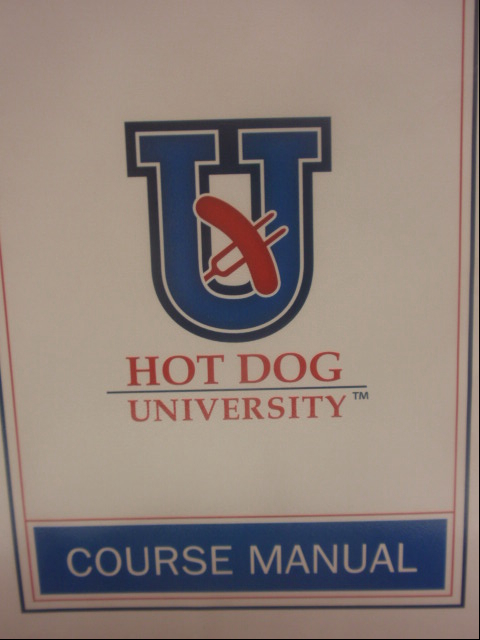 A special thanks to Jim Ellison, proud graduate of Hot Dog University. May all your encased meat dreams come true.